Trailer Wizards to work with Lethbridge Truck Terminals to better reach the growing Southern Alberta market. We recognized the need in the expanding deep Southern Alberta market and delivered on our commitment to providing customers access to our trailer services. 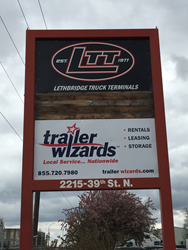 Trailer Wizards has teamed up with Lethbridge Truck Terminals (LTT) adding a new trailer pick-up and drop-off location in Lethbridge, Alberta. Conveniently located five minutes from the Crowsnest Highway at 2215 39 Street North, the location will offer trailer renting and leasing options as well as trailer pick-up and drop-off services. Customers will also have access to commercial vehicle inspections (CVIs) from this location. With a shared commitment to safety, LTT have been serving the southern Alberta market for nearly 40 years. Trailer Wizards will be positioning approximately 25 trailers in their yard with the goal of doubling the fleet size within six months. Trailer Wizards Ltd. is Canada’s largest and only national commercial trailer rental, leasing, sales, service, parts, and storage company. For over 50 years, Trailer Wizards Ltd. has been delivering professional commercial trailer solutions with fast, customer-friendly service while continuously driving out costs. Trailer Wizards Ltd. is once again a winner of Canada’s Best Managed Companies program and provides “Local Service… Nationwide.” For more information, visit http://www.trailerwizards.com and follow on Facebook, Twitter or LinkedIn. LTT is a Lethbridge based company that supplies tractor/trailer service including truckload, less than truckload, warehousing and other freight handling services to a variety of transportation and manufacturing companies out of our terminal located in the northeast corner of the Lethbridge industrial area. LTT operates as a regional carrier within, but not limited to roughly a 1000 km radius with licensing and operating authority throughout Alberta, British Columbia, Saskatchewan, Manitoba, Montana, Idaho and Washington. For more information, visit http://www.lethbridgetruckterminals.com or write us an email at info(at)lethbridgetruckterminals.com.